Giving car buying advice is hard, people tell you they want one thing, when they really mean something else. This is how comedian and car matchmaker Spike Feresten selects cars based on a buyer's needs, wants, and personality. Even then, he still can't predict what they are going to choose. Spike Feresten has written television comedy from SNL to Letterman and even some of your favorite Seinfield episodes (No soup for you!). He is also a certified car-nut wit a Porsche fetish, despite the fact he owns a Prius, and has been helping car-buyers for years. He even convinced Jerry to buy the iconic Porsche 917 used by Steve McQueen in the move Le Mans. 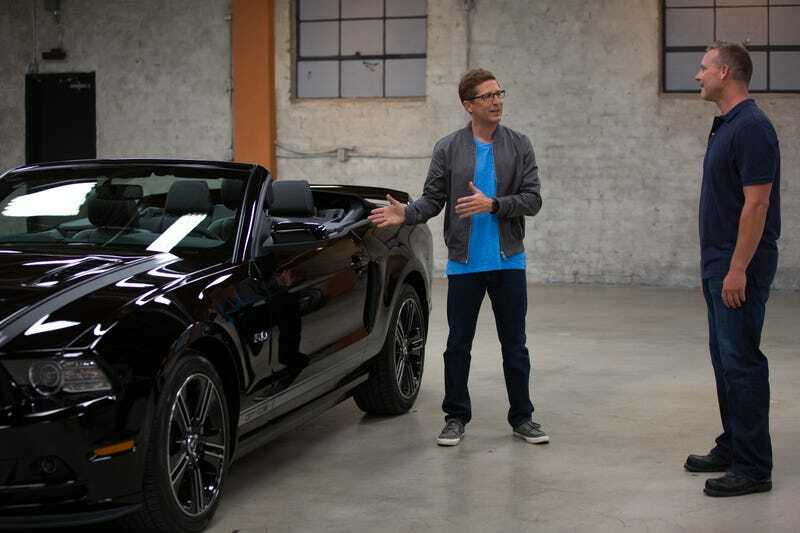 Spike is the star of Esquire Network's Car Matchmaker, where he helps car-buyers figure out the best vehicle. Like many of you, I help people buy cars all the time, so I gave Spike a call to find out his methods. How did you get started being a car matchmaker, and what was your first deal? I don't recall the first car...when people hear you are a car guy, they come to you for advice. they don't want to take it..had some luck taking them out of their comfort zones. Some people need a "car intervention." I knew a guy...big masculine dude who was driving a white over tan luxury sedan. But in L.A. that is the quintessential "trophy wife" car...so I ended up getting him something that fit better with his character...a nice mean looking Range Rover. Do you have a specific methodology when it comes to matching people with cars? If I don't have much time...I want them to prioritize what kind of driver this car is going to be. I need to know is it a commuter, a fun car, a collector car? Once I know the main use of the I can satisfy that box, I can pretty much hit the mark. On the show we focus on a specific aspect...like a muscle car, or an all-wheel-drive car. But usually these are everyday vehicles so I have to keep that in mind. Of course we want to entertain on the show so we try to get some variety in the vehicles. Sometimes I just get cars that I want to drive...like the Buick Grand National. Have you ever had an impossible customer that you couldn't "match?" There are difficult personalities that don't really want your advice, but they ask anyway. We all know these people, they have already made up their mind on what car they want to buy. They don't want you to tell them to buy something else, they just want verification on what they picked. The funny thing is 70% of the time I'm wrong on the show when I try to predict what someone will choose. That is why we give them a few options, because so many times it is some little thing that they experience when they drive the car that changes the choice. How do you get the cars for your show? This first season it was challenging to get certain cars because we would need something right away and have to shoot an episode the next day. Most of the cars come from the manufacturers press fleets and they are representative of what someone could buy. Occasionally we get some dealer cars and some cars are for private sale and we borrow them for the show. Once someone picks out a car, how do they buy it? Well after the show they would have to go to the dealer and do that whole scene. But as the show progresses we are looking for ways to integrate that process a little more. What I'm trying to do is make car buying fun. It's too bad they can't buy what they want like a Tesla, that is a brand that has it right. I think the dealerships keep putting themselves in a position where they seem more irrelevant. Buying a car should be a buying an iPhone...here is what it is, that's the price. It's what people want. What was your favorite car to match? Vintage cars are where my heart lies,that is the most fun because we get to go back in time. But it is important to really discuss those types of purchases with other people who know what they are doing. How valuable will it be? Is it going to be fun to drive? How many were made? Anyone who collects vintage cars needs those guys around because it's a lot of money. Seinfeld's Porsche 917 is probably my favorite. That's the thing...you have to encourage your friends to buy cars you can't afford so you can drive them. Everytime I visit him I just stand there and look at it for half hour selfishly. For those that don't get the benefit of having you match them with cars, what advice would you give? Favorite piece of advice... rent the car...borrow the car, If you can't do that...go on YouTube and look for the regular people who are talking about their cars. You will get some insight that you won't get from those magazine style reviews. Go to the forums read about the experience and reduce the risk of making a mistake. When I buy a car for seven to fourteen days I say to myself "This is the car I'm buying." If 80% of the time I'm happy when I say that, I figure it is the right car. I've also been talked out of cars, for awhile I wanted the Leaf. I thought it looked cool and I liked the EV aspect buy all my friends said "The car matchmaker doesn't drive a Leaf." So I bought a Prius, it is sinfully ugly and I want to set it on fire, but it saves me a ton on gas. And I have plenty of vintage cars when I want to have fun. Also, if you need to sell a car sell it to your friends so you can still use it. Car Matchmaker is on Tuesday nights at 9pm EST on the Esquire Network.